I have been meaning to post this recipe for almost a week. We've had a few computer issues lately which has put a bit of a monkey wrench in my photo organization. Somewhere in the shuffle of transferring photos off of one computer to an external hard drive and uploading other photos to my laptop, well, I managed to "misplace" the pictures I had saved for these delicious mashed potatoes. 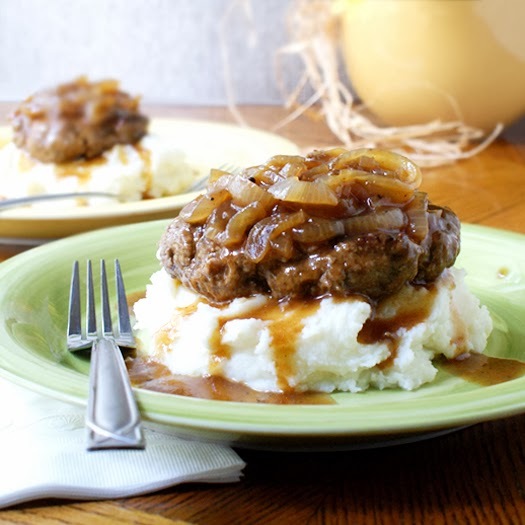 So, being the resourceful girl that I am, I'm borrowing the photo from my Salisbury Steak recipe so that I can get these posted for you! Otherwise, this one will sit in the draft pile until I make mashed potatoes again. And these are too good to put on the back burner until later. These potatoes are the perfect creamy, traditional mashed potatoes. They are seriously exactly what your basic mashed potato recipe should be. Sure, you could dress them up with some garlic, fresh herbs or cheese, but why mess with perfection? They are the ideal accompaniment to pair with all of your cold weather roasts and comfort foods. And let's not forget Thanksgiving! Bookmark this one for turkey day! Peel the potatoes and cut into 1 inch cubes. Place into a pot of water and bring to a boil, then reduce heat to simmer. Simmer, uncovered, until the potatoes are tender. Drain. Meanwhile, heat the milk in a small saucepan until warm. After draining, put the potatoes into a large mixing bowl and add the butter, warmed milk and salt. Beat until smooth and creamy! Make sure don't let your potatoes sit for too long before beating them. One Thanksgiving a few years back, I was running around like a crazy woman trying to get everything finished at the last minute. I drained the potatoes and let them sit while I finished up a few other things. When I came back to them, they had cooled too much and when I mixed them they were like glue! So, unless you like to eat glue, I'd suggest mashing them up while they're piping hot. Try these potatoes served alongside Chicken Fried Chicken with Pan Gravy, Meatloaf Muffins or Garlic Pork Roast!